The Secret World of Arrietty is a Studio Ghibli film, released in North America by Walt Disney Pictures, and is based on the book The Borrowers by Mary Norton. It follows fourteen-year-old Arrietty (voiced by Bridgit Mendler) and her friendship with sickly boy named Shawn (voiced by David Henrie) who has moved into her house. Arrietty is a Borrower, a little four-inch tall person, who lives with her parents underneath the house and it is against Borrower rules to let themselves be seen by "human beans". Shawn in his desire to help Arrietty inadvertently causes more trouble for the Borrowers as the housekeeper, Hara (voiced by Carol Burnett), begins to get suspicious and will do anything to prove to the world of the existence of the "little people". I remember reading the Borrowers when I was in elementary school. It was one of my favourite series back then so I was thrilled to hear that Studio Ghibli had picked up the classic childhood book. 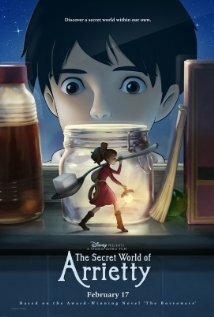 The Secret World of Arrietty is another amazing movie produced by the studio and joins the likes of Spirited Away and Ponyo. What I really noticed about the movie was the detail drawn into each frame. And the soundtrack. The music blew me away! Get the soundtrack if you can, it is a very uplifting music. The version I watched in theatre is dubbed and the voice actors all did a fantastic job. Arrietty's mom Homily, voiced by Amy Poehler, and Carol Burnett's Hara got most of the laughs from the audience. The entire movie was beautiful and magical to say the least. Great storytelling, amazing artwork, stellar music and the pacing was just right. You can tell when children don't get restless in the theatre that the movie has captivated them. There were many children in the theatre and they all squealed with delight and laughed at Hara's antics. It is a great family movie that addresses loneliness and friendship that everyone will enjoy. The Secret World of Arrietty comes out in theatre on Friday, February 17th, 2012.